Take Invisible Deck (performed by David Blaine) and add one more HUGE climax! This effect is almost too powerful! You ask a spectator to name any card in the deck. She tells you which card she has chosen. You remove a deck of cards from its box and fan the cards. There is one card face up in the deck -it is the spectator s freely named card! Now, for the *second* climax. You prove that you knew the card to be selected in advance by showing that spectator s card has a different colored back than the remainder of the deck! 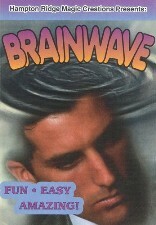 This is a real Bicycle brand deck that was handmade into a Brainwave deck. The familiar Bicycle look and feel will take the heat off the cards.